Golden's GAC 400 Medium can replace rabbit skin glue as a canvas primer. Traditionally, rabbit skin glue (also known as hide glue) was used to reduce the flexibility of canvas before painting. Although it reduces flexibility, it is extremely brittle. Rabbit skin glue is hygroscopic, which means that it always remains water-soluble. Even when completely dry, high humidity will re-introduce water into the film, causing it to soften or swell up. Over time, this constant swelling and drying of the film can cause severe paint-film cracking and delamination. GAC 400 can be used in a similar fashion for stiffening canvas. 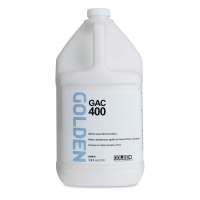 Although GAC 400 does not quite achieve the stiffness of rabbit skin glue, it does not remain water-soluble. Apply one or two coats directly into the raw canvas, coating both front and back for maximum stiffness. 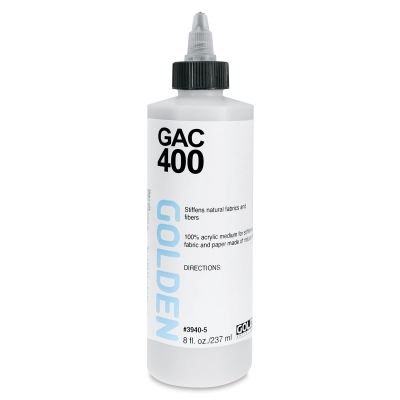 GAC 400 must be applied directly to raw canvas. It is ineffective over any other medium. Used over other mediums, it will flake off and cause delamination of subsequent paint layers. Since it is an acrylic polymer, it is not hygroscopic. However, neither rabbit skin glue nor GAC 400 is completely effective against oil penetration, and the use of GAC 100 over GAC 400 is recommended for oil painters. 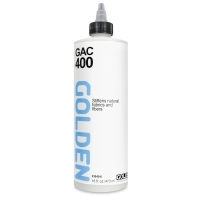 Note — Since GAC 400 is brittle, canvas or fabrics treated with GAC 400 should not be rolled tightly or bent backward. This will cause cracking of the polymer film and may transfer cracks into additional paint layers. This is especially a risk with cured oil paints.